October 26, 2018, Chicago – More than a year after her death on September 7, 2017, Sister Mary Rita McSweeney, OP, received the St. Louise de Marillac Award for her 25 years of dedicated ministry to the senior citizens through Marillac St. Vincent Services. The award and Sister Mary Rita’s former ministry site are named for St. Louise de Marillac, co-founder with St. Vincent de Paul of the Daughters of Charity in France. 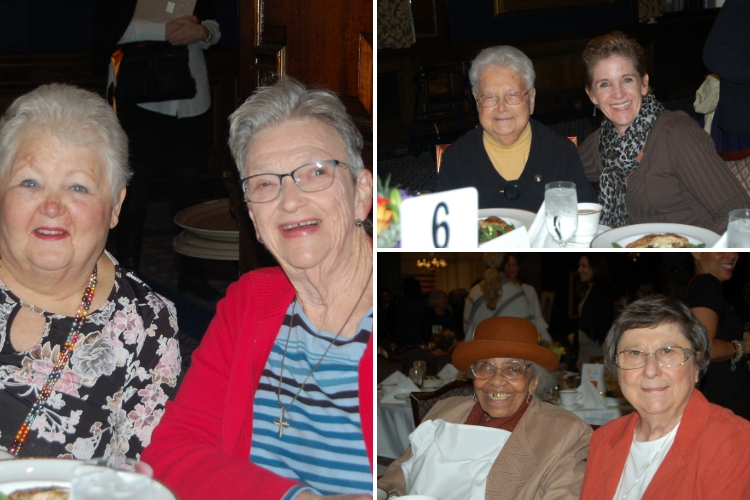 Among those attending the October 12, 2018, Beacon of Hope Luncheon were Adrian Dominican Sisters Norine Burns, OP, Nancy Murray, OP, Cyrilla Zarek, OP, and Jane Zimmerman, OP. Also attending in Sister Mary Rita’s honor were her nephew Michael McSweeney of Louisville, Kentucky; nieces, Diana McSweeney of Scottsdale, Arizona, and Mary McSweeney of Canton, Michigan; and five seniors with whom Sister Mary Rita had ministered. Marillac St. Vincent Services is the result of a 2002 merger between two independent organizations run for more than 100 years by the Daughters of Charity: Marillac Social Center and St. Vincent de Paul Center. Marillac offers services to people in need in Chicago, from early childhood programs for newborns through 5-year-olds, to youth services, programs for pregnant teens, adult employment programs, to food pantries and other programs for senior citizens. After teaching for 40 years, Sister Mary Rita retired from Catholic education and began 25 years of ministry with Marillac’s senior programs. Her ministry included visiting and calling homebound seniors and working with the Take Charge senior group, which grew to more than 80 participants. Read a profile of Sister Mary Rita McSweeney and watch a video of the luncheon. Feature photo (top): Robert Christopher, Director of Development of Marillac St. Vincent Services, presents the St. Louise D’Marillac Award to family members of Sister Mary Rita McSweeney, OP, from left, nieces Mary McSweeney and Diana McSweeney and nephew Michael McSweeney.